How was your Christmas? I hope you had a lovely time. I tend to go through colour phases with my outfits and my colour of the moment is pink. Hot pink, that is! I was never really a fan of pink as a girl, but now I love it! It's such a fun and vibrant colour: perfect for summer! Lately I've been wearing this hot pink top quite a bit. It brightens up any outfit and is made from 100% cotton, so it is perfect for the hot weather. 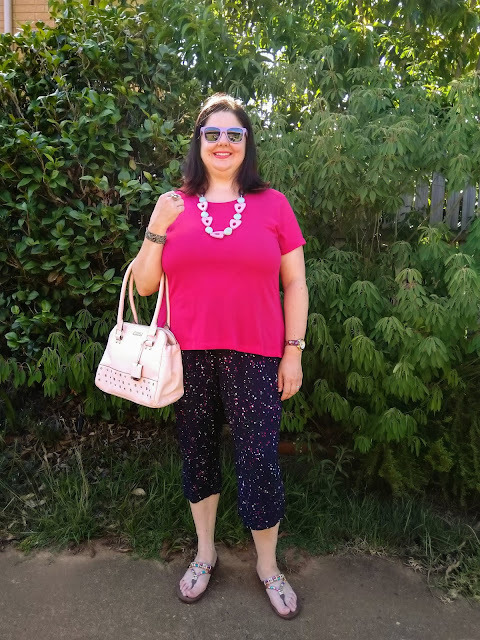 In the first outfit, I paired it with my new spotty pants and in the second outfit, I paired it with my recently thrifted skirt. 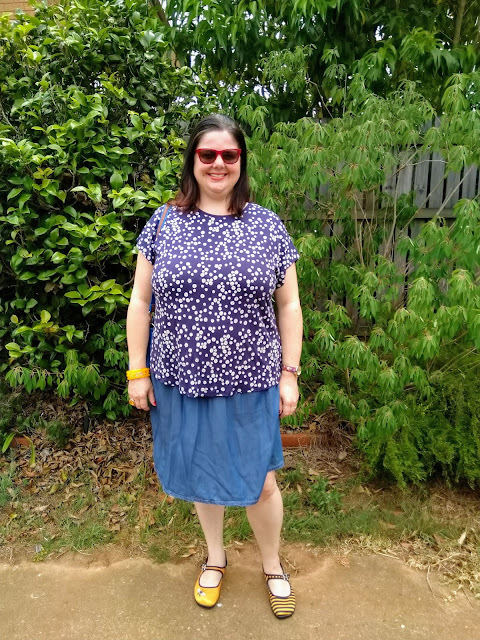 This skirt was such a great op-shop find! 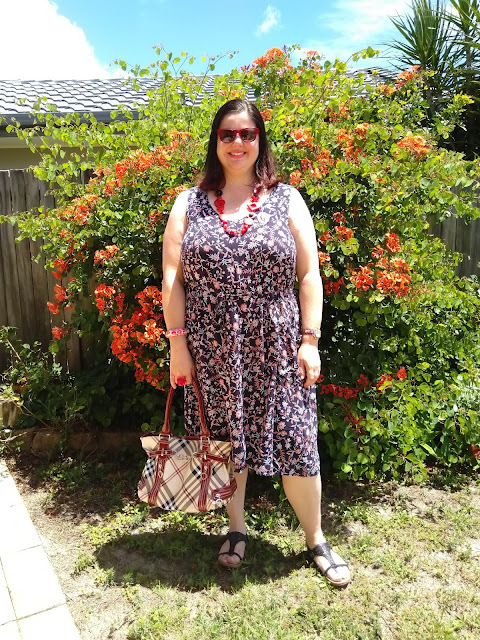 I absolutely love the colours and print and it is such a great length to wear in this hot weather. The thing I love most about blogging is that it inspires me to not only embrace my own style, but it encourages me to try out other trends. Nautical inspired outfits are a classic, but have never particularly appealed to me. In recent times though, I have been drawn to anchor motifs and other fun nautical inspired clothing and accessories. 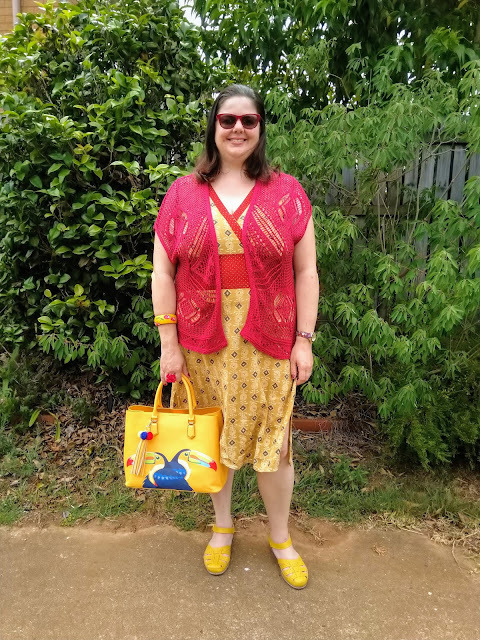 I thought it would be fun to put together two new outfits from my wardrobe! 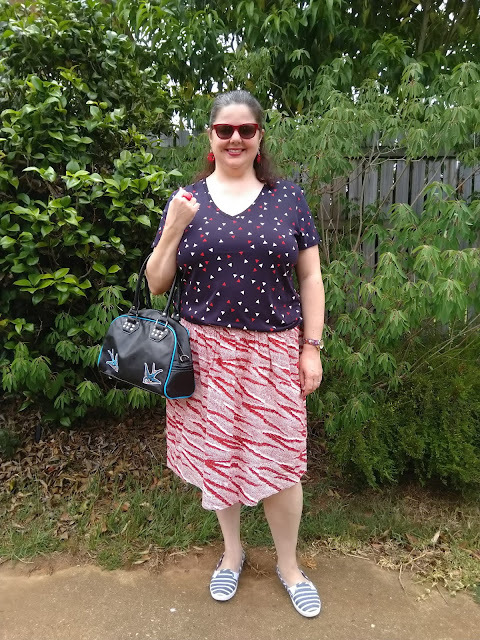 Both outfits include my red and white skirt from 10+ years ago. This skirt is one of my faves and has appeared on the blog several times! 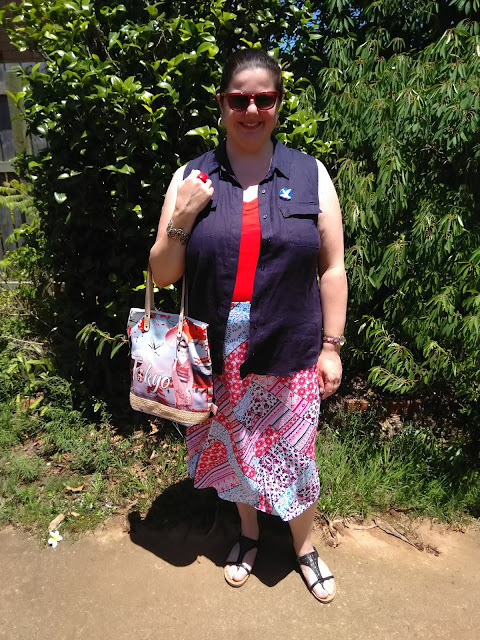 I think it is perfect for a nautical inspired outfit, although at this time of the year it looks more like a Christmassy/ candy cane inspired skirt! Either way is fine by me! ;) In the first outfit, I paired a top with a print that has triangles on it, but to me they resemble little boats! Well, you can't get much fresher than this daisy top, because I only bought it a few days ago and this was its first wear! I've always loved daisy flowers for their simplicity and natural beauty. I probably started liking daisies in fashion and as a fashion accessory, in the 90s when I was a hugeteenager and loved Drew Barrymore! Remember when she always wore daisies in her hair? I always wanted to wear them in my hair too, but never did. I would have worn them for this post if there were any in our garden! Remember making daisy chains as a kid? I would've made a great Hippie in the 60s, if I'd been born earlier!